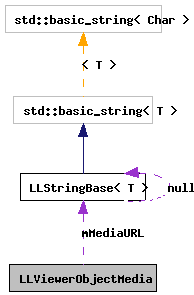 Definition at line 656 of file llviewerobject.h. Definition at line 659 of file llviewerobject.h. Definition at line 663 of file llviewerobject.h. Referenced by LLViewerObject::getMediaType(), LLViewerObject::processUpdateMessage(), and LLViewerObject::setMediaType(). Definition at line 661 of file llviewerobject.h. Referenced by LLViewerObject::getMediaURL(), LLViewerObject::processUpdateMessage(), LLViewerObject::sendTEUpdate(), and LLViewerObject::setMediaURL(). Definition at line 662 of file llviewerobject.h. Referenced by LLViewerObject::getMediaPassedWhitelist(), LLViewerObject::processUpdateMessage(), LLViewerObject::setMediaPassedWhitelist(), and LLViewerObject::setMediaURL().